Whether you’re hiring a beach wedding band for your North Carolina Beach wedding or you need great live music for your next corporate gathering, you can be sure it’s going to be difficult at best when you’re choosing from the thousands of bands in the area. 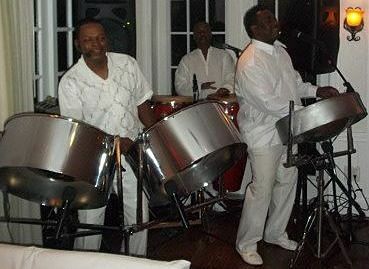 Make your party, event or gathering come to life and enjoy the best calypso, reggae, soca and steel drum music from RythmTrail steel drum band. just a click or phone call away and we can provide you with the awesome and upbeat sounds of a total full-on steel drum band or a simple but soothing solo performance. RythmTrail has the right music at the right price no matter what or who is coming to your event. Native Caribbean islanders with over 20 years of Steel Drum Band expertise ensure that you’ll get the top steel drum players in the state to make your special day or any day a truly memorable one. RythmTrail offers music for beach weddings and any other event or gathering throughout North Carolina, nationwide and even internationally, so you can be sure you’re going to get the ultimate live band for your ceremony music or rocking house party band, wherever and whenever you need us. We can even let you create your own personal playlist of tunes and songs, so you’ll hear exactly what you want. Or let RythmTrail take care of the music and set the party’s tones with dancing, upbeat and even romantic music that is sure to please all of your guests no matter what their tastes or ages are. Call RythmTrail today at 866-495-4522 or get a free quote online and sweep your next party away to the islands of the Caribbean.